Up to 12 species of whales are to be found in the Bay of Fundy during the summer months. The whales use the bay as a feeding ground, nursery and play area. They feast on the enormous amounts of krill, squid and schools of young herring, pollock and mackerel found in the bay as a result of the powerful Fundy tides. The Bay of Fundy is also a preferred location for whales to give birth, both for the abundant food and for the protection that the Bay provides. The Finback Whales, Minke Whales and Harbour Porpoises are the first to arrive from their southern migration grounds in the late spring. The Humpback Whales and White-sided Dolphins return in June and by mid-July all the whales, including the rare North Atlantic Right Whale, have returned and they usually stay in the Bay of Fundy until fall. For this reason, the Bay of Fundy whale watching season runs from June to October inclusive. The best month to go whale watching is definitely August. All porpoises, whales and dolphins are known as Cetaceans, which comes from the Greek word Ketos meaning Sea Monster. They are mammals that breathe air, give live birth, are warm blooded and suckle their young. The whales skin can be 14” thick, the eye the size of a grapefruit, the heart the size of a car! Whales common to the Bay can be up to 16m (52 ft) in length and can weigh up to 40,000 kilograms (88,000 lbs). It is estimated that between the Gulf of Maine and the Bay of Fundy, the whale population ranges between three and four hundred at any one time. The common whales in the Bay of Fundy are “baleen” whales as opposed to “toothed” whales. The baleen is similar in composition to our fingernails and consists of a series of plates with hair fibres that enable the whales to strain large schools of prey. 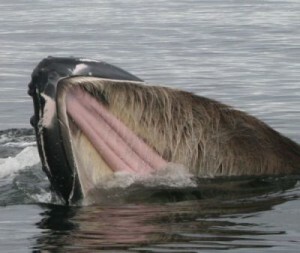 The baleen grow out of the upper gum palate and are set up parallel to each other. The whales will feed by either swimming along the surface with their mouths open or by diving down and engulfing a large quantity of water. Main food sources for whales and dolphins include plankton (microscopic plants and animals), krill (look like small shrimp), cope pods and small fish including herring or cod. The Bay of Fundy is an important feeding ground with the high tides, currents, and upwelling helping to concentrate the food source for these large mammals. The most commonly sighted whales in the Bay of Fundy are the Humpback Whale, Minke Whale, and Finback Whale. The endangered North Atlantic Right Whale, White-beaked Dolphins, Sei Whales and Pilot Whales are occasionally observed. And, although they are know to visit the area, it’s considered rare to see a Blue whale, Sperm whale, Killer whale, or Beluga whale. Minke whales grow up to 9 meters (30 ft) in length and weigh up to 10 tons. This is a baleen whale with a V-shaped pointed snout, sharply curved dorsal fin and a distinctive white strip on their pectoral fin flipper and ventrally on the belly. They traveling in pods of about 2 to 3 whales, commonly feed on plankton, krill, and small fish and have even been reported to chase small schools of herring and cod. The Minke Whale can dive up 20 to 25 minutes without surfacing, but most dives are only 10 to 15 minutes. They usually live at the surface making it an ideal whale for whale watching. It is estimated that there are about 800,000 Minke Whales world-wide. 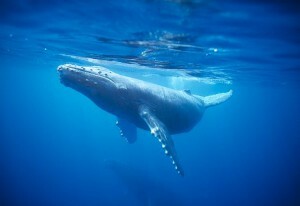 The Humpback Whale gets its name from the way it arches its back out of the water before diving. Its a playful whale that may put on a show including breaching (jumping up out of the water), spy-hopping (snout and eyes vertically out of the water to look around and see who is on board the whale watching tours that day), flippering and tail lobbing (slapping their fin or fluke on the water) or rolling on the surface. Humpback whales grow up to 18 meters (60 ft) in length and weigh anywhere from 30 to 50 tons. The females are slightly larger than males. The spouting is bushy and about 10 feet tall. The long white flippers, 1/3 of their body length, allows for body heat to distribute when in the warmer southern waters. The humpback whale can be identified and named according to the distinctive white pattern on the bottom of the tail fluke. Humpbacks have big appetites, consuming between 4,400 and 5,500 pounds of plankton and krill daily. When they are in the Bay of Fundy, they are in the feeding half of their migratory pattern, spending the other half in the southern hemisphere to breed. When they travel back and forth they average 1000 kilometers per day. This is the second largest whale in the world after the Blue Whale. Although they have an average length of about 19 meters, Finback whales can grow up to 25 meters (82 ft). They may live more than 75 or even 100 years. A distinctive white patch on the right side of the jaw may be seen as they surface for air. Finback whales are usually found in small groups of about 2 to 7 whales per pod. They spout up to 4 meters (13 ft) above the water and can be viewed from a mile away. Numbers are on the decline with the added fishing and shipping traffic but populations still hover around 80,000 world-wide. The Bay of Fundy serves as the summer home to many Northern Atlantic Right whales – the most endangered whale in the world. This slow giant used to be plentiful in the Atlantic ocean, but was over hunted in the 19th century. The right whale gets its name because according to hunters it was the “right” whale to kill. They are slow swimmers, easy to approach, rich in blubber reserved for oil, and have long baleen plates (used previously for umbrellas, combs, corsets). This catch was also easily towed in because it floats once killed. The Northern Atlantic Right Whale migrates between the coastal waters off the southeast United States and the Atlantic coast of Canada. The highest summer population exists in the Bay of Fundy, while the highest winter population exists between Brunswick Georgia and Augustine Florida. Migrating to and from these areas takes the Right Whale through some of the busiest shipping lanes in the world. Though the species has been internationally protected since 1935 and listed under the Endangered Species Act of 1973, it has yet to recover from its devastating past. Busy shipping lanes often interfere with migration routes. Right whales often become tangled in commercial fishing gear. It is estimated that fewer than 400 right whales are left in the Atlantic Ocean. The Bay of Fundy provides an important “nursery” where the calves are raised. Right whales grow up to 15 meters (50 ft) in length and weigh up to 45 tons. These are a dark colored whale with no dorsal fin. They can often be spotted resting on the surface and may be mistaken for a log in the water from a distance. The spouting is V-shaped. Right whales have white callosity markings on their snout by which they may be identified, named and catalogued. At times the Right Whales form SAG (surface active groups) averaging 6-15 whales rolling and courting each other, the water churning, snouts, flippers and tails displayed. This impressive sight can be seen in the video to the right. We will be in the area Oct 17-19 are any tours operational at this time and are chances good of seeing whales or will they be gone? I have a cosin visiting Canada from England for the first time. I would love to take him on a Whale Watch. I live in CapeBreton and will travel anywhere thats the best to see the whales this time of year. Thanks for any info. Hi we are out for Thanksgiving and wondering if we may get to see any whales ? We will be in Nova Scotia the last week of September… what are our chances of Seeing whales.. and how far out do they go to see them… Are there other creatures we might see , like Seals, puffins and other sea birds?? Suggest you go out on a zodiac boat, we went with Fundy Tide Runners out of St Andrews NB. They can get out further than some of the larger whale boats and reach some of their favoured feeding grounds. Despite a lot of fog we had a great trip, lots of humpback and fin plus puffin, minke, seals & porpoise. Have fun. I can travel between July 10 to August 11th. When would be the best time to have a chance to see whales? Mid July…We would love to see whales up close. Tell us about the Zodiac. When Where. How rough is the water and what does a Zodiac feel like? Do you know what time of day the whales are typically most active? Would I be more likely to see playful behavior if I were to go on a morning, afternoon or evening cruise? (This is assuming I’d be going at peak season in August). We will be there October 3, 2016. What are our chances of seeing whales? I know it is pretty late in the season. Very informative and engaging website. Thank you. One question did come to mind as I was visiting your website. What types of otters live in the Bay of Fundy region? We will be in New Brunswick October 20th, will the whales be gone then? Although the Bay of Fundy whale watching season runs from June to October, the best month to see whales and other wildlife is August. October 20th is really very late in the season, so your chances of seeing whales aren’t all that good. We are planning on a whale watch excursion in the Bay of Fundy next week and were wondering if they are still there or if they have migrated south already. I would appreciate any information. They were still here as of yesterday. I think you’ll still be able to find whales next weekend, but the end of the season is definitely approaching. St. Andrews is one of the best spots to go whale watching and they typically have several sightings per tour. That being said, they are trying to find wild animals in a very large body of water so they can’t guarantee that they’ll find whales every single time. We are looking at visiting bay of fundy. We need some help if there is anybody there. We are keen to see whales, migrating birds, beavers and especially moose. We are also interested in countryside and mountains. We believe a good time to visit would be mid/end August. Any feedback would be most welcome. August is an excellent time to visit. For more information, take a look at our resources page (https://www.bayoffundy.com/resources/). I can highly recommend the free guides from both provinces. Hi Mike! My family and I are coming out here for Augest and we were wondering if there have been beluga sightings recently. Great article on the whales of the Bay of Fundy. Just a few things to think about when planning a whale watch: different areas offer different excursions, some focus mainly on whales but others also include seals, pospoise and seabirds. Whale migrations should also factor into when you’d like to go whale watching. The first whales sighted in our area (St. Andrews/Fundy Isles) are the Minke whales, they usually arrive early June. The second species of whale is the Fin whale, they arrive typically early July. Humpbacks migrate into our area usually late July into August and then the North Atlantic Right Whales can make an appearance anywhere from late July-October. Hopefully this provides some insight into whale watching in our area – check out Island Quest Marine for more info! It’s an amazing experience!